Asagi Magoi is basically a modern day black colored koi carp known for its trademark bluish reticulated scale pattern combined with some red hi appearing on its side and belly otherwise known as Hi Asagi. They are special in their very own way classified into different group away from the typical showa as they command the respect, loyalty and fast becoming one of favorites among koi collectors. There are several different types and variety of the fish and basically what sets them apart from each other is the combination of hi and how it extends beyond the body region. Basically a well developed specimen must have its head region completely white without a speckle of hi or dots and there must be a clear borderline separating the head and the reticulated net-like scales. Asagi is often judged based on its symmetrical appearance whereby the hi (red patch) development and distribution on both sides of its body must be well balanced. The red color is not the one similar like you would see appearing on a kohaku but rather it appears somehow pale orangey. Handling an asagi and housing them in the pond bears some critical aspect that needs to be taken into consideration because if let’s say the scales are lost, this will introduce defect on the fish, hence loosing its value. Some other common faults seen on an asagi is the appearance of random hi among its bluish black colored scales. For the koi fish to be considered a high standard quality grade, the color of the scales must remain true blue color, else slight fading that turns it into gray will mean significant reduction in the overall value of the specimen. Shusui which means “autumn water” in Japanese language is also a koi carp variety that closely connects to the asagi. They are basically Doitsu Asagi meaning that the koi have no scales except for two blue colored lines running parallel from head to tail appearing on each side of the dorsal region. Similarly like the asagi, the head must be clear white without presence of any visible marking while the red hi distribution should cover the lower region of its body. 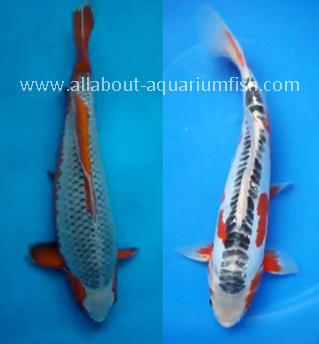 There are generally two different types of shusui identified by hobbyist, one considered the more common which is the Hi Shusui and another is the Ki Shusui which is basically a yellow colored variety of the same koi fish. Apart from these two, there are also several forms of the fish classified under its own group normally based on its color pattern and distribution, notably the Sanke Shusui and the Showa Shusui.